We want to share our passion of growing delicious food with you! Eat delicious, organic food and support three small farms at the same time! Our produce and meats are raised with natural practices in mind. We believe in less: less pesticides, less hormones, less worry. 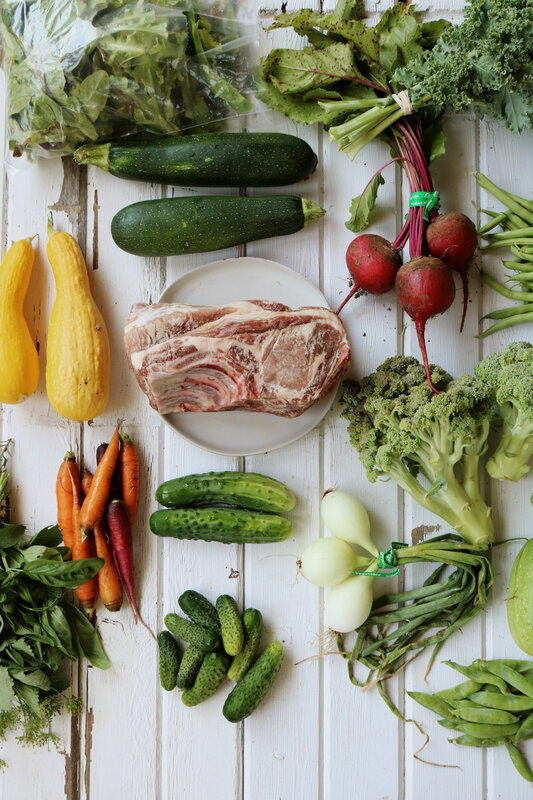 Our CSA program revolves around a small community of growers that share in the same understanding that the best food is homegrown. With a combination of talents, we know that you will enjoy this amazing selection of farm fresh ingredients for your family’s table! Every Week and Every season is different. If you decide to take the leap and join the Under A Tin Roof CSA Program, you will learn the pleasure and positive outcome of eating the freshest seasonal produce, meats, and eggs. You are supporting a passion project built by small, sustainable farmers who have a love of providing food for your family and their own. You will find food that is grown and raised with sustainable, natural practices in mind. We provide a program with a season that is 23 weeks long, divided into 2 separate seasons or purchased as a full length package. This is from June through November. Unless we fill up, new shareholders can join the program at any time and the price will be adjusted based on the date you sign up, though this may result in missing out on certain aspects of the program like seasonal veggies or meat. Our baskets come with a set inventory of food for your family and can feed a family of 4 people, or 2 people who mostly eat at home. We also offer a half share, which includes a lesser amount of vegetables that is perfect for 1 to 2 people. At this time we do not offer custom boxes. Please continue to scroll and read to learn more about our program. Learn More about what comes in each share. from our farms to your table. Under A Tin Roof Farm offers two Community Supported Agriculture seasons for you to join - Summer, and Fall. CSA members can choose one or both options to enjoy throughout the year. Our entire season lasts 23 weeks, June through November. We offer pick-ups at the Under A Tin Roof Country Store (Tuesday 10AM-5PM) and the Iowa City Farmer’s Market (Wednesday 5-7PM). 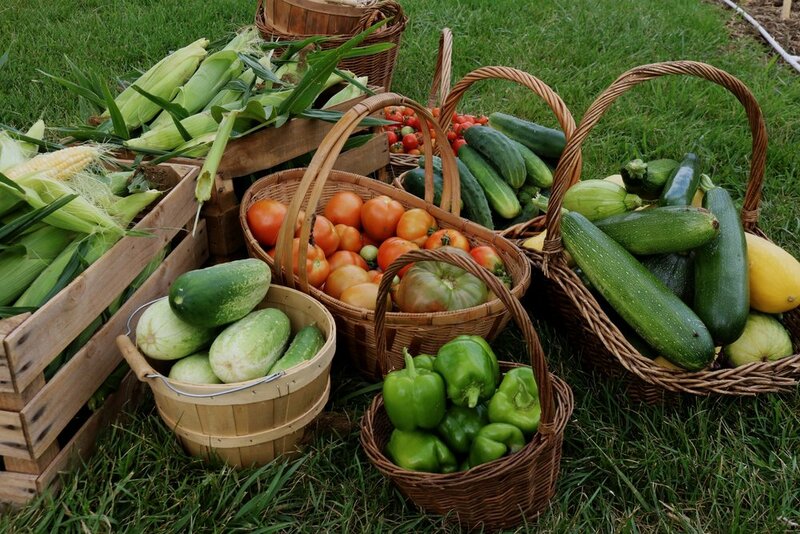 Each week, you will receive a fresh basket of food from our farms. Our current share types are listed below for you to choose from. You may decide to add on certain items to your share a la carte such as pork, chicken, beef, turkey, or fresh cut flowers. Pick-Up day is every Tuesday from 10AM - 5PM at Under A Tin Roof Farm + Country Store located at 3119 320th St, Wellman, IA 52356. If you choose to pick-up at the Iowa City Farmer’s Market, we will be there on Wednesdays from 5PM - 7PM. We do not offer bags at this time, so please bring your own. You may also purchase from our selection of reusable canvas totes at 10% off. Please Note: Under A Tin Roof Farm will do their best to offer a wide variety of fresh, organic, and pesticide-free produce and cut flowers. Please understand that there is always a certain risk involved in farming. Although it is rare, crop failure can occur. Additionally, please understand that the given dates are subject to adjustment based on Mother Nature. We do not offer refunds for farm products. If you have questions, please check our FAQ page. If you need additional help feel free to contact us at any time. read about each share option below! Summer: June 12th - October 9th. 18 weeks of produce in a 1/2 bushel or 1/4 bushel option. Vegetables include lettuce, kale, chard, greens, radishes, garlic, broccoli, peas, kohlrabi, cabbage, scallions, beets, beans, potatoes, carrots, summer squash, cucumbers, eggplant, tomatoes, peppers, onions, melons, and winter squash. Fall: October 9th - November 13th. 5 weeks of produce. Vegetables include kale, chard, lettuce, spinach, greens, garlic, turnips, beets, potatoes, onions, carrots, radishes, winter squash, sprouts, broccoli, cauliflower, kohlrabi, cabbage, and scallions. Summer will include pastured chicken and pork bundles every other week (about 5lbs each) from Wild Farm. You have the option of alternating chicken and pork, or receiving just one or the other. Fall will include 4 weeks of pork bundles and can end with a pastured turkey on the final week! Add on a Beef Share (various beef bundles, about 3-5 lbs, each week for 23 weeks) and/or a Flower Bouquet Share. Flower shares are only available during the Summer Season. Please Note: We are offering Pick-Up Locations this year. Choose which place you would like to pick-up your share weekly below. This cannot be changed during the season. Do you crave the taste of fresh garden veggies? From broccoli and roots to hearty greens, tomatoes, and squash our Summer CSA season is always full of delicious organic produce from our farm such as Lettuce, kale, chard, spinach, greens, radishes, garlic scapes, broccoli, peas, kohlrabi, beets, turnips, scallions, Asian greens, tomatoes, squash, potatoes, beans, cucumbers, sweet corn, pumpkins, and more. Add on 18 weeks of pastured pork bundles and/or chicken (about 5lbs each week) from Wild Farm, located in Wellman, IA. These can include a range of different cuts such as bacon, roasts, ham, loin, chops, and more. If you want even more meat in your share, we have a NEW addition from The Barn Iowa’s farm. Add a Beef Share to your Summer CSA (about 3-5lbs each week). This will include various beef cuts such as ground beef, steaks, roasts, tenderloin, and more. You can even add flowers as well (these are only available in the summer). Our 18 Week Summer CSA Share will begin on June 12th and end on October 9th. Our Fall CSA is the final community supported agriculture share of the season. This share is filled with wonderful autumn produce including radishes, turnips, rutabagas, broccoli, cauliflower, winter squash, scallions, carrots, Asian greens, spinach, fennel, Brussels sprouts, and more. Add on pastured pork bundles that can include a range of different cuts such as bacon, roasts, ham, loin, chops, and more (about 5 lbs each week). Looking forward to Thanksgiving? In the final week, you can even receive a pasture raised turkey! If you want even more meat in your share, we have a NEW addition from The Barn Iowa’s farm. Add a Beef Share to your Fall CSA (about 3-5 lbs each week). This will include various beef cuts such as ground beef, steaks, roasts, tenderloin, and more. Flowers not included in summer. The 5 Week Fall CSA Share will begin October 16th and ends November 13th. Is there anything better than receiving a bouquet of fresh flowers? We can tell you what’s better - purchasing flowers that are grown locally! Did you know that more than 80% of flowers purchased in the United States are grown overseas? These blooms are grown most commonly in South America, raised with heavy use of pesticides, herbicides, and fungicides and under poor labor conditions. Flowers bought at the grocery store, if imported, are often well over a week old which means that they will only last a handful of days on your table. Buying local flowers means that you are taking a part in a movement. By purchasing from us, you are saying no to the use of harsh chemicals, carbon emissions from long-distance shipping, low quality product, exploitative labor practices, lack of diversity in flower variety, and a floral industry that is focused more on cheap profit than quality. This share includes a weekly large bouquet of diverse, fresh, interesting, beautiful, and long-lasting flowers. Flowers will be different every single week and throughout the entirety of the season. Enjoy specialty blooms like dahlias, snapdragons, stock, zinnias, sunflowers, bells of ireland, and more. The 18 Week Summer Flower Bouquet CSA Share will begin June 12th and ends October 9th.